Allsteel Terrace 6×6 and 8×6 cubicles. These group of 72 stations is mostly 6×6, some all 64″ high and some 64″ high step-down to 54″ high. Stations have L-shaped worksurfaces, 2 full height pedestals and an overhead bins with light. 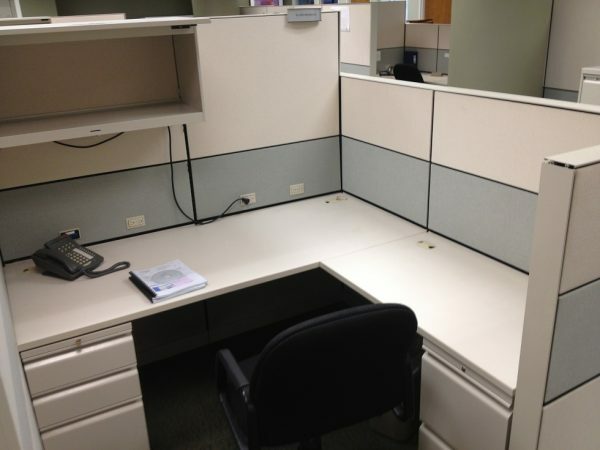 The 8×6 stations are all 64″ high with a BBF ad 2-drawer lateral. Overhead bin with light. The worksurfaces are set-up in a U-shaped configuration. Product is in good condition.